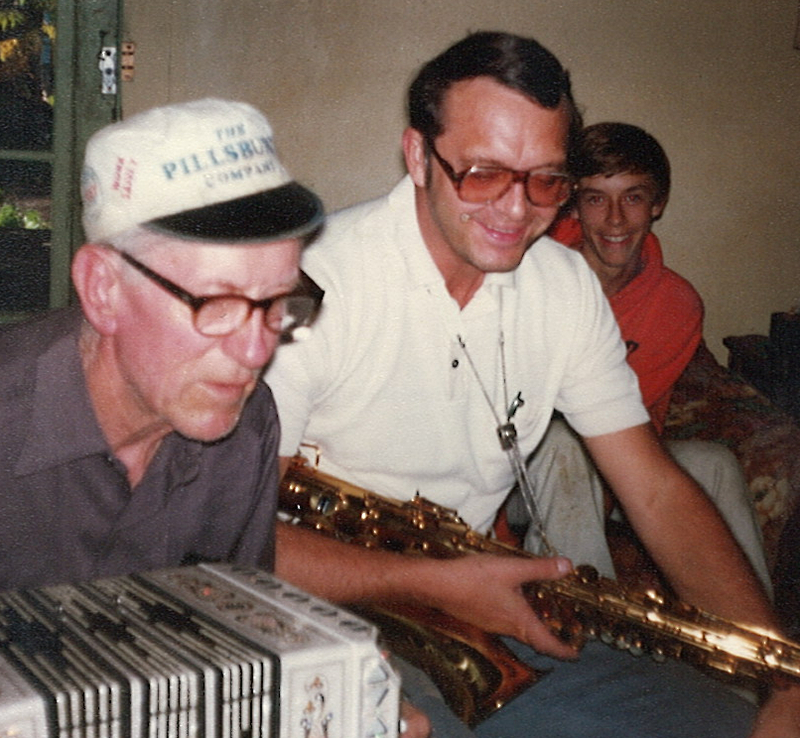 Young David Black plays tenor sax with his grandpa, John Galman, Jr. on concertina, 1979. Those of us who grew up watching “The Lawrence Welk Show” with our ethnic parents and grandparents remember their enjoyment of the accordion and polka music, even as we embraced the “Rock ‘n Roll” revolution of our own generation. Back in the 1950s and ‘60s, more than one young Elvis or Beatle wannabe had to take accordion instead of guitar lessons at the behest of parents who were still part of a musical tradition going back to the Old Country. Whether your immigrant forebears were from Lithuania, Hungary, or Poland, traditional music—at least as it survived in Springfield—seemed to be defined by the concertina (or squeeze box) and lively, danceable tunes. 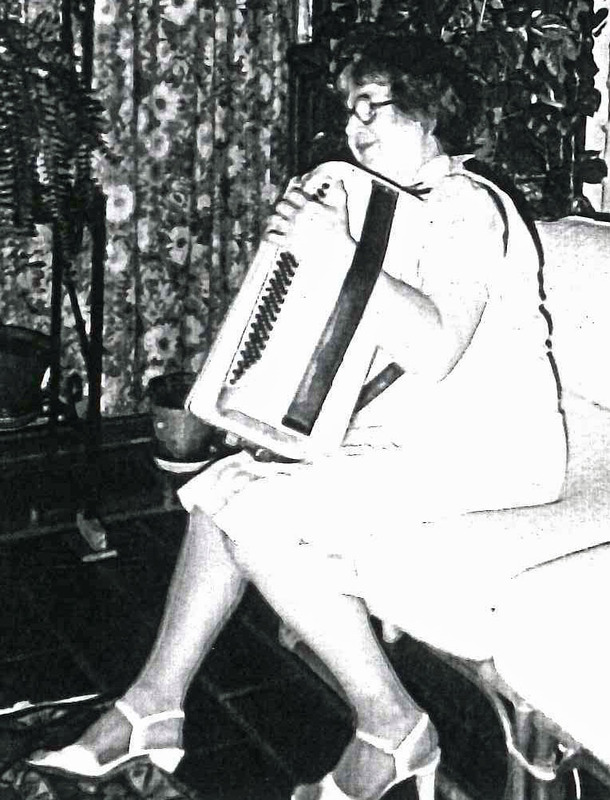 Josephine (Kohlrus) Baksys playing son-in-law Jay Wheeler’s accordion, 1984, Courtland, Calif. When we were big enough, we girls were allowed to carefully take the huge instrument out of its red velvet-lined case and try to pick out a tune. It was like playing the piano—if you had to hold that piano in your arms and play it without being able to see any of the keys, while also pumping a giant bellows. Just making that full-size accordion “breathe” was hard work. My close encounters with the accordion are echoed even more sweetly and strongly in the memories of David Black, a Lithuanian-American of the Galman clan who grew up in Springfield but now lives in North Carolina. David has been a musician most of his life, starting with alto sax in Fairview Grade School, progressing to tenor sax in the Stage Band at Lanphier High School and the Jazz Band at LLCC—and later, weekend gigs with jazz and R&B bands in Silicon Valley, where David worked in high tech after earning pre-engineering (LLCC) and computer science (U of I Champaign) degrees. David, who also plays the electric and acoustic bass, grew up knowing music has no boundaries, as he was exposed to both the music of his times and the concertina-polka passions of his maternal grandfather John Galman, Jr.
Jonas Galminas (John Galman, Sr.) Certificate of U.S. 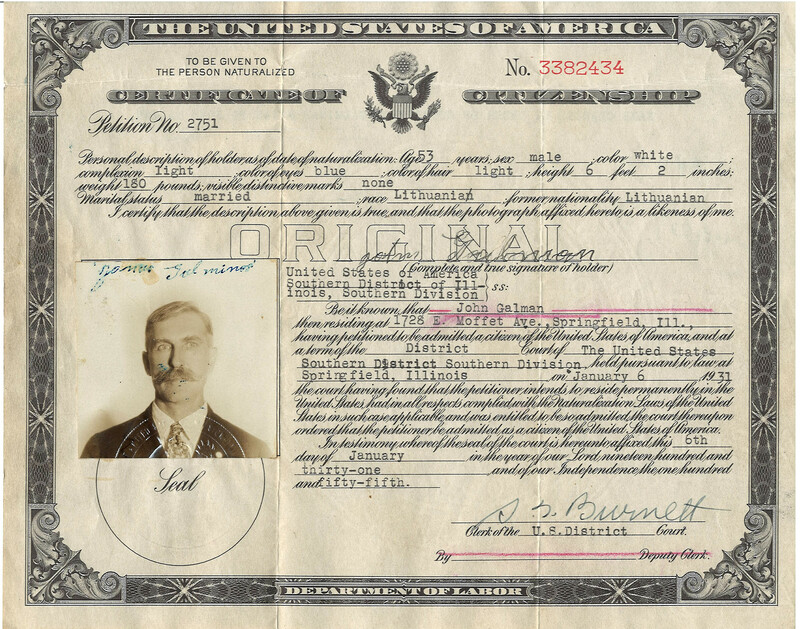 Citizenship, 1931. The Galman story goes back to Lithuanian immigrants Jonas and Eva (Shouygaska or Swieguski) Galminas, who immigrated to the U.S. in 1905. Jonas, who changed his name to John Galman, Sr., was a coal miner who became a naturalized U.S. citizen in 1931 at age 53. 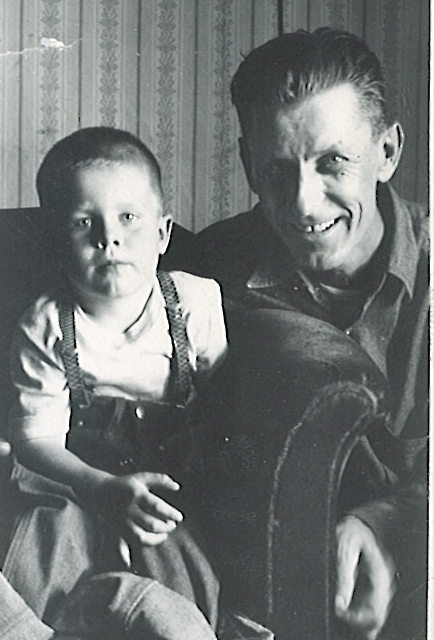 He and Eva raised sons Antanas (Antone), Adolph, John, Jr. and Charles Galman at the family home at 1728 E. Moffatt St.
David Black as a little boy with his Grandpa John Galman, Jr. circa 1965. John, Jr. (1909-1998) was the “music man” of his extended family who loved, collected and played concertinas: small, accordion-like instruments. According to David, “Grandpa played the concertina very well, and he used to play polkas with me on tenor saxophone. He would drive to Chicago and buy these marvelous, large concertinas of a type called Chemnitzer, named after the area of Germany where they were invented.” For a time, John, Jr. also played concertina for the customers at Lithuanian-owned Pokora’s Tavern on South Grand Avenue East. Grandpa John is remembered working as a master plasterer and at the Illinois department of signs, before joining Pillsbury Mills, where he worked as a custodian for many years. Relatives also report that during Prohibition, John, Jr. made bulk sugar deliveries or “runs” to the still in the basement of The Mill tavern at 15th and Matheny. 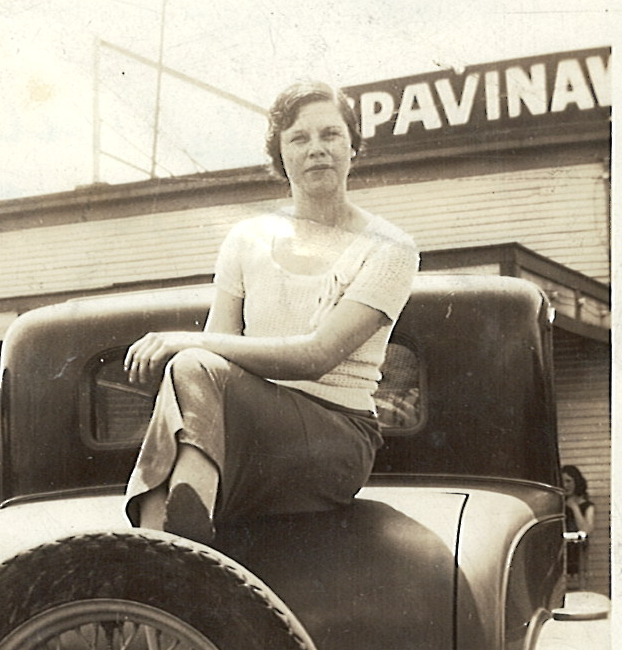 John, Jr.’s wife Clema in Oklahoma. 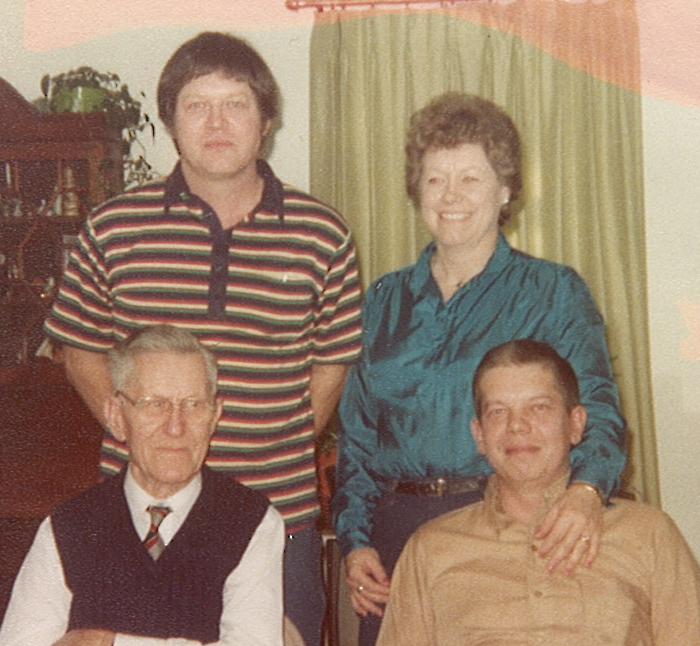 Grandpa John, Jr., bottom left, with sons David, upper left, and John III–and daughter Marilyn. Grandpa John, his wife Clema and their family (sons David and John III and daughter Marilyn) associated with other Lithuanian-Americans in the neighborhood, especially the Albert Stasukinas family that owned Alby’s Tavern. David Galman (David Black’s uncle) was so close to Albert’s son John Stasukinas that he was nicknamed “Stutz.” The Galmans also socialized at the Lithuanian-American tavern just around the corner at 1737 E. Moffatt: The Lazy Lou, which was owned by Frank W. and Mary (Gerula) Grinn. David’s mom Marilyn Galman graduated from Lanphier in 1959. “I remember her telling me she was a Lanphier track queen, and after graduating, she also did a few modeling jobs. She was a pretty woman with an irresistible smile,” he recalls.After high school, Marilyn worked for the Illinois Department of Vocational Rehabilitation until marrying Jerry Paul Black in 1962. Three sons followed: David, Dan, and Tim. 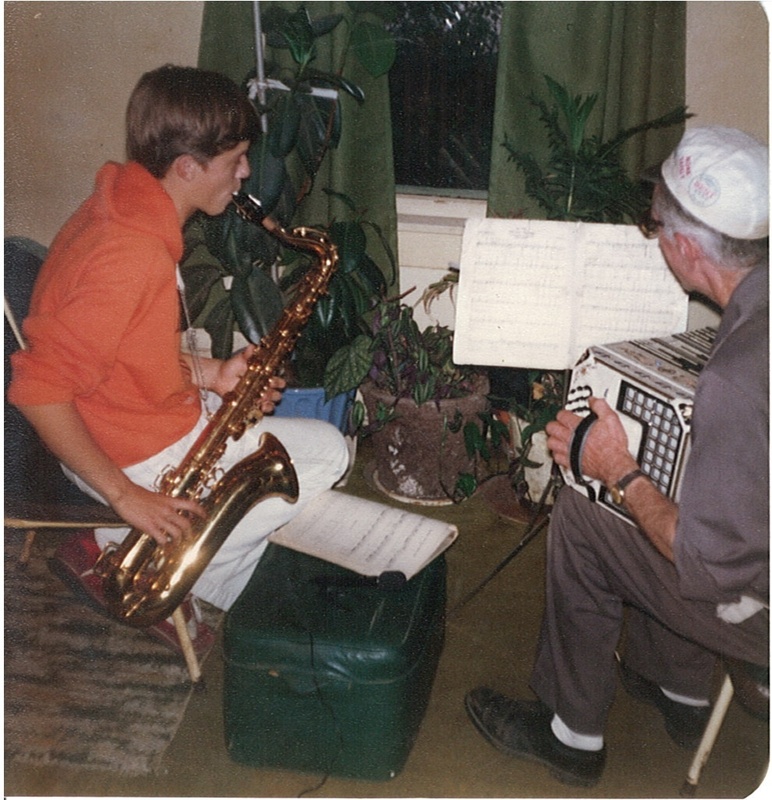 John Galman, Jr. on concertina and son-in-law Jerry Black on tenor sax, 1979. David actually gets his musical ability from both sides of the family. Dad Jerry, a photogrammetrist (map-maker) with IDOT’s Aerial Surveys department, played gigs on tenor sax with the Harmony Brothers Band, featuring Ben Harmony. Even as a baby, David remembers hearing his father play electric piano at home, and it was his dad who later introduced him to the saxophone. 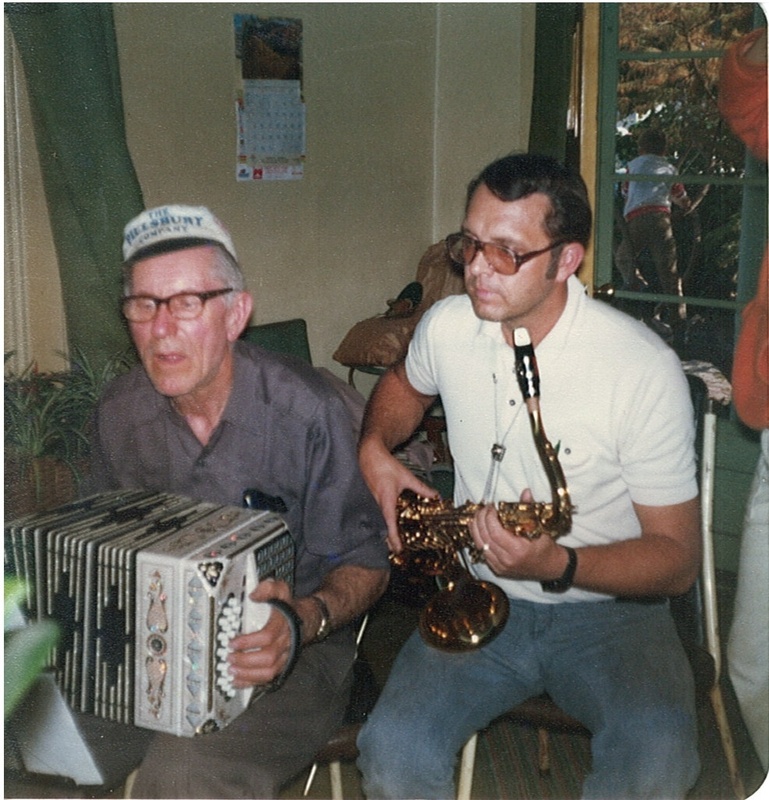 Grandpa John (in his Pillsbury hat) on concertina, with his son-in-law Jerry on tenor sax and grandson David Black, 1979. What a great family story-music is a great connector. I was acquainted with Dave and John III via Bill Urban. John III was an electronics wiz and repaired a CB radio for me back in the day and it then worked great. I remember Dave being called ‘Stuts’ but never asked how he got that nickname. Mystery solved. Thanks, Sandy. Very nice story. Oh, a wonderful story….so close to my heart. An accordian player would come to my grandparents’ tavern (Bernie’s tavern) weekly. Everyone would dance. I was about 5 when I learned to polka….loved it then, and still love it today. Such merriment and fun!!!! Marilyn was a year ahead of me at LHS. She was petite and very pretty, as well as being friendly with a beautiful smile. Very nice. John Jr. was my great-uncle (my maternal grandfather was Anton). It was great coming across such a wonderful story while researching my family history. Music seems to run in the blood of the Galman family – my son and I are both musicians as well!